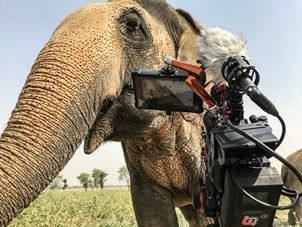 Having purchased the EVA1s specifically for the wildlife project, Callahan has gone on to utilize the cameras for many high-profile commercial spots for GEICO, Alfa Romeo, Tide, Black & Decker, LensCrafters and Alaska Airlines, among others. “When producer Erik Oberholtzer and I met with Nikki Sharp, who heads up Wildlife SOS’ U.S. office, and discussed the organization’s plans for upcoming animal rescues, we both felt this was a story that had to be told,” Callahan said. “I needed exactly the right cameras for what I knew would be an incredibly taxing shoot,” the DP continued. “What I look for in a camera is reliability, usability and image quality. The EVA1 is one of the top cameras I’ve ever evaluated in terms of color science and dynamic range, and I chose it over much more expensive options. The DP said he shot in 4K, recording ProRes HQ externally to an Atomos Shogun Inferno, with internal back-up to the EVA1’s SD cards. (ProRes HQ was chosen to avoid transcoding and make the footage direct-to-edit.) For lensing, he chose Tamron 24-70 and 70-200 G2 zooms, as well as a set of primes. To view examples of Callahan’s EVA1 work, visit https://www.cinematicgroup.com/ourwork/. For more information on Wildlife SOS, visit http://wildlifesos.org/usa/.